There’s no place like home — but owning and keeping a house in shape can be a burden, both physically and financially. 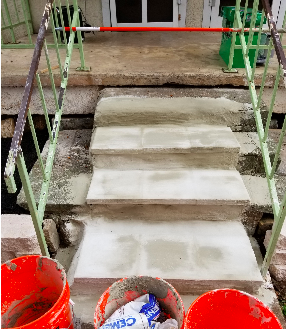 We focus on serving residents who don’t have the resources to make critical safety and health repairs to their home as well as safety modifications for accessibility. Through our work, we seek to preserve individuals’ mobility and independence, keep housing affordable, and strengthen communities through neighbors helping neighbors. We partner with the City of Austin Neighborhood Housing and Community Development Department as well as the Texas Department of Housing and Community Affairs. These programs provide funding for these repairs. We also partner with local companies to provide team building opportunities for their employees while they provide minor repairs and clean up. If you or someone you know are interested in requesting home repairs, you can apply online, or print and return your application along with proof of income. Please feel free to call us with any questions at 512-993-8230. We focus on critical health and safety repairs related to the seven principles of healthy housing: ensuring homeowners have a dry, clean, ventilated, pest-free, safe, contaminant-free and maintained place to live. We provide repairs to all low-income homeowners who meet our eligibility criteria, including seniors, people with disabilities, families with children, and veterans. Homeowners are helped on a first-come, first-served basis, pending availability of resources. Must reside in either Travis, Hays, or Williamson counties. Must own home. As a general rule, RTA does not work on rental units. However, we do sometimes have funding sources that will allow us to make safety modifications to a rental home for a person with a disability, such as walk-in showers, ramps, and grab bars. Rental unit upgrades require landlords to be involved in the process. Must be current on property taxes or on a payment plan. Entire household must qualify as low-income and must meet the income criteria in the table below. A two-person home can make up to $55,050 / yr and qualify. Every project has a different timeline based on needs. On average, each project takes several months, including the application process, fund sourcing, and build of each home. While repairs are completely free for homeowners, you will be asked to sign a release of information form. This form allows Rebuilding Together Austin to work collaboratively with other area agencies to provide the most effective and comprehensive services available to you.